Our next meeting is January 12th 2013 and will be our AGM meeting in the morning, followed by an in-house session in the afternoon. Most of us will probably be practising our Rustic Caps from the last workshop! In the AGM we'll review last year and confirm what we plan for this year's workshops and in-house sessions. 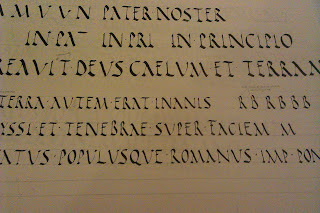 If you're interested in Calligraphy and want to see more of what we do then you're more than welcome to come along and meet us all. We meet every month, on the second Saturday (except July & August) and have a mix of professional tutor workshops and in-house 'self help' group sessions. Our December meeting seems to have come around fast this year! 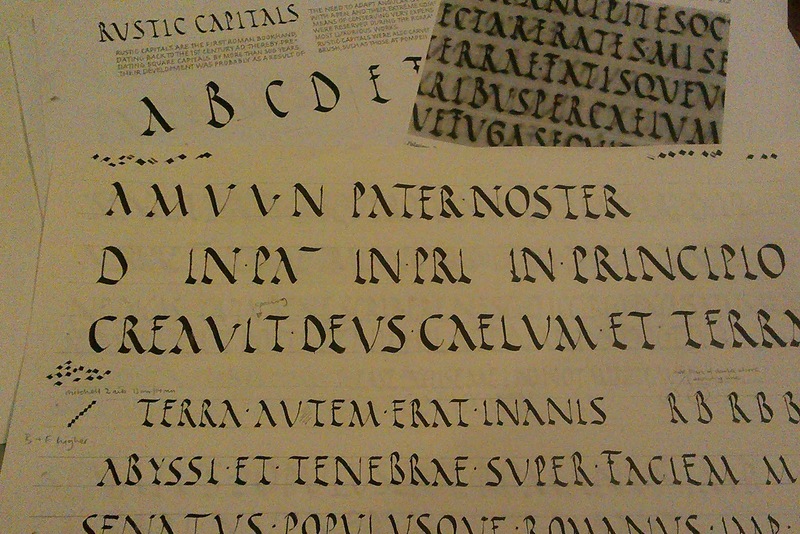 We were lucky to have Jilly come and visit us to take a workshop on Rustic Capitals. 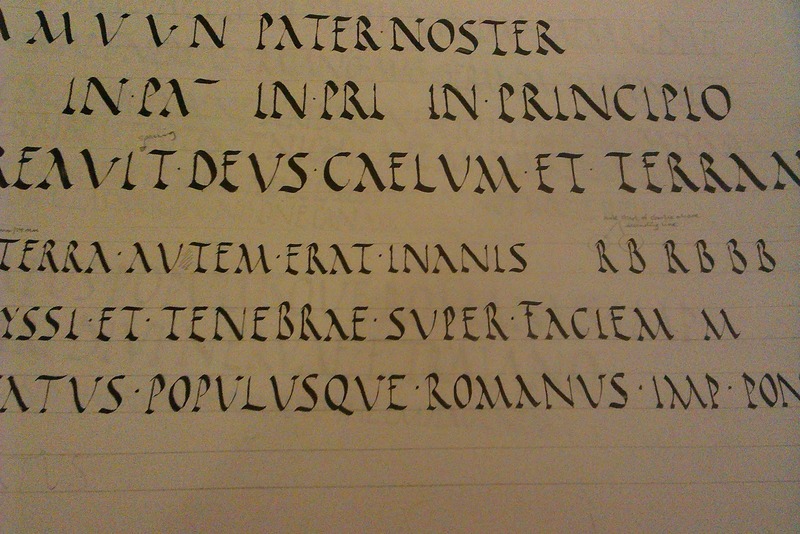 Now I have to admit I wasn't too keen on learning this historical Roman scrip. But a couple of our members wanted to explore it further so Jilly came and did an excellent workshop with us - and yes, converted me into appreciating the script more! There aren't many example of this script around which is probably why it's not that familiar, and unlike most hands, it requires a lot of pen manipulation - pen angles range from 45 degrees up to 80 degrees depending on which letter you're writing, and as you bring the nib down on a vertical stroke you twist the pen slightly to get a thicker 'flared' line towards the bottom serif. It's not for the faint hearted, and even Jilly warned us at the start of the day this would be hard! As usual the whole group really threw themselves into the workshop session and I think we surprised ourselves at the end results. I haven't taken many photos this time but the below hopefully gives a flavour of the script. We were also able to welcome Clare, a new member who joined us last month from the Kendal area. 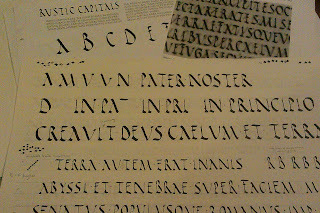 as a beginner to calligraphy Jilly was able to spend the day getting her used to Foundational Hand and the basics of letterform construction. Back in August myself, Cynthea and Mabel went on the residential course with Jilly at Alston Hall, the theme for the week was Letters As Patterns, and right up my street as a designer! I have to say the stay at Alston was superb, the food and accommodation was excellent and the location as a retreat was perfect. There was about 12 of us on the course which was a decent size and meant that we all had a lot of one-on-one tuition with Jilly. Below I've popped some photos on that show the group work over the week. The day's involved two morning sessions, lunch, afternoon session, break followed by a free session, then the evening meal and a late session - we usually finished about 10pm in the bar with a glass of wine (and for those of us staying in the stable block where the workshop was we could sneak in a quick hour before breakfast also!!). The above pieces were written with a fineliner pen, dividing lines between each letter with the shapes filling the whole space, colour divides the letters making it legible. Letters above written, overlapping/reversed and coloured. Above two quotes using Neuland script - the below piece of work is by Jilly Hazeldine. At the end of the week we pulled all our pieces together which was a great way to discuss and enjoy each other's work. I certainly enjoyed the week and am looking forward to the next one!